ST. LOUIS, May 17, 2018 � Emerson today announced it has agreed on terms to acquire Aventics from Triton for a cash purchase price of �527 million. Aventics is among the global leaders in smart pneumatics technologies that power machine and factory automation applications. Emerson is a leader in fluid automation technologies for process and industrial applications, and Aventics significantly expands the Company�s reach in this growing $13 billion market. Aventics builds upon and strengthens Emerson�s capabilities and solutions in key discrete and hybrid automation markets, including food and beverage, packaging, automotive assembly and medical equipment. Emerson�s expanded offering creates one of the broadest portfolios of fluid control and pneumatic devices that incorporate sensing and monitoring capabilities to improve system uptime and performance, enhance safety and optimize energy usage. These technologies complement Emerson�s extensive innovation and leadership in improving operations through digitalization, pervasive sensing and asset health monitoring. �We will now offer the industry�s widest range of fluid automation products and solutions with unmatched delivery, reliability and performance, and now with the addition of Aventics� expertise, Emerson is positioned to be the most capable global company when it comes to fluid automation technologies,� said Emerson Chairman and Chief Executive Officer David N. Farr. �This acquisition adds another strong, complementary technology portfolio into the Emerson family, creating value for our customers and more opportunities for growth,� Farr added. 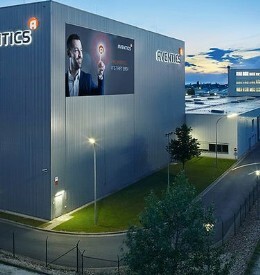 With central offices in Laatzen, Germany, Aventics has approximately 2,100 employees globally with five manufacturing locations and 2017 sales of $425 million. �Aventics brings technologies, capabilities and expertise that are critical to digitalization of manufacturing, including predictive maintenance through integrated diagnostics, an important priority for our Automation Solutions business,� said Mike Train, Executive President, Emerson Automation Solutions. The acquisition is expected to close in the fourth quarter of fiscal 2018 subject to regulatory approvals, Aventics� finalization of necessary consultations and other customary closing conditions.